I wanted to dislike “The President is Missing” by Bill Clinton and James Patterson. After all, a cynic might say that a book co-written by an ex-president and one of the country’s most commercially successful and prolific novelists might be an easy means to cash in on their respective successes. I felt this book would be a huge best-seller no matter what it contained, but most likely would not live up to the book’s promise. I have to admit I was completely wrong about this book. This was a really interesting read, and although I found it a bit tedious at times, I thoroughly enjoyed its conclusion. The last third of the book held my attention like a good thriller should. The authors combined the intimate knowledge of the Presidency that only an ex-president would have, with the superb writing craft of a best-selling author. It worked! “The President is Missing” will be a best seller, and it deserves it on its own, not just on the prior accomplishments of its coauthors. The book starts when the president decides he is the only one who can stop an immediate crisis. The premise sounds far-fetched, but Clinton and Patterson pull it off. It is very believable. The book is largely written from the first person point of view of the president of the United States, facing congressional hearings, personal issues, and an unfriendly political landscape. I found the first few chapters, dealing with the machination of congressional hearings, to be completely riveting, with the voice of an ex-president who is familiar with the process coming through loud and clear. The first few chapters were, in my opinion, the strongest part of the book. The middle of the book moved very slowly for me, but the conclusion held my attention to the very last page. I look forward to another installment in the collaborative effort of Clinton and Patterson. The book has a few weaknesses, in my opinion, but none that should discourage a potential reader from investing some time into “The President is Missing”. I felt the characters could have been developed more fully. The character of the president is the most fully developed, as I would have expected. Perhaps one might criticize this character as being a little too saint-like. The characters who surrounded the president could have been a lot richer. Even the bad guys in this book could have been fleshed out a little more. My major criticism of the book was that it was a bit preachy, with the president prone to long speeches that detracted a little bit from the plot. I guess ex-presidents can do that and get away with it. Clinton and Patterson certainly got away with it. The preaching did not detract from my enjoyment at all. I obtained this 2018 book as a gift from a family member. I also posted a copy of this review in Goodreads. 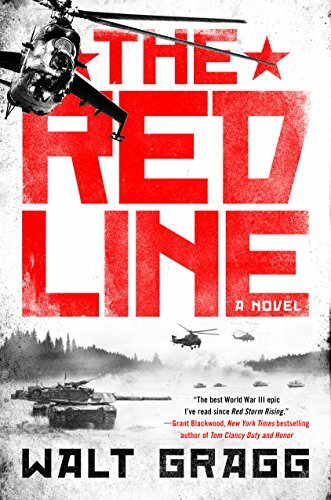 “The Red Line”, published in 2017 by Walt Gragg, is a World War III scenario. He did a fine job with it. “The Red Line” grabbed me right from the beginning. His political scenario was very plausible and his descriptions of the folks in the trenches were realistic and riveting. He pulled absolutely no punches and conveyed the horrors of modern warfare to the reader without any sugar coating. His story included combatants and their loved ones. There is bravery and heartache on and off the actual battlefield. He walked the fine line showing the great heroism by those fighting the war without glorifying warfare. The technical details seemed to be accurate but not overwhelming to this non-technical reader. As a navy veteran, I was hoping to see more Navy characters. Gragg’s only Navy character was relegated to answering the phones. An aircraft carrier was destroyed in one sentence. This comment is more good natured inter-service ribbing than a serious criticism. Gragg’s story of what World War III might be like for the participants was riveting. I recommend this book highly. “The Red Line” was one of five nominees for the “Best First Novel” at the 2018 Thrillerfest. Apparently many others liked the “Red Line” as much as I did. I bought this novel at the 2017 Thrillerfest after meeting the author. “Bloody Sunday”, by Ben Coes is a very well-written 2018 thriller about a superhero, Dewey Andreas, who is tasked with trying to assassinate a top general in the North Korean military. In the middle of this operation, the hero manages to inject himself with some of the poison intended for his target. This starts a ticking clock scenario. This was the first book by Ben Coes that I read. Coes’ protagonist, is an interesting character: a CIA operative who seems to have an unlimited level of endurance and resilience. He is also very slightly flawed. He drinks too much, and he even manages to inject himself with poison during a very unlikely operation against a North Korean general. Things get even crazier after that. Dewey Andreas does the impossible in just about every chapter. He even makes periodic quips when he is in the middle of an operation. I have seen other authors try this, but Coes does it very well. The author layers a very clever sense of humor throughout this novel. Beginning with his backstory in which the author summarizes some of Dewey Andreas’ prior exploits in a few short paragraphs, the reader gets an idea as to what to expect. To me, the backstory came off as slightly unbelievable and somewhat humorous. I believe the author intended this atmosphere of light humor throughout the novel. I found that to be the best part of the novel. It is a lot more clever than just non-stop action. Coes writes excellent non-stop action, however, and if non-stop action is your thing, “Bloody Sunday” will make you very happy. If you approach “Bloody Sunday” as fantasy and a fun thrill-ride, you will enjoy this book very much. Dewey Andreas is a little too capable for my taste, but his adventures make great fantasy. I believe a reader would enjoy this novel more if they had read some earlier entries in the Dewey Andreas series. Also, I was wondering about Dewey Andreas’ drinking. It seemed heavy to me and it didn’t really seem to have much to do with the plot, at least in this novel. His drinking certainly didn’t interfere with his combat skills. There was also a subplot about a strong female character in “Bloody Sunday” that seems to lead into the next book. I usually view lead-ins like this as an unpleasant but frequently used marketing technique to generate interest in the next book. I understand the need to do this, but I felt this particular subplot did not add much to this story and did not pique my interest for the next novel. My criticisms are small, however, and a reader looking for a fun thrill-ride with a very effective ticking clock with an overlay of light humor will thoroughly enjoy “Bloody Sunday”. I read this as the result of a NetGalley offer. I will place a version of this review in NetGalley and Goodreads. I was a volunteer at Thrillerfest this year. I would recommend anyone attending Thrillerfest for the first or second time and feels he is an outsider to consider volunteering at this event. I can vouch that it was a lot of fun. Yes, a little work was involved and a small commitment to do certain things at certain times is necessary, but the plusses far outweighed the minuses. They do allow the unregistered significant other of a Thrillerfest participant to volunteer at the Registration Desk, the Volunteer Table, or at Pitchfest. It is actually a nice way for the significant other to feel like a part of the event and absorb some of the atmosphere at Thrillerfest. Since this was my first run at volunteering at Thrillerfest I volunteered for something in three of the four categories. I also volunteered Mrs. Writerunderconstruction for the registration table at the same time as my own volunteering gig on two evenings, just before the Craftfest cocktail party on Wednesday, and just before the Thrillerfest Opening Reception on Friday. I also volunteered her to work at Pitchfest, so she could catch a glimpse into the hard facts of the thriller publishing world. My first volunteering gig included acting as a timekeeper for F. Paul Wilson on “Conveying Characters”. I was also timekeeper for Carla Buckley and Jenny Milchman’s session on “Bad Guys, Villains. Keeping time was really pretty easy and involved holding up cards at 10 minutes to go and 5 minutes to go and also signaling the end of the session. The advantage of timekeeping is that you do get to attend the session, and you do get a chance to meet the panel participants. I volunteered for timekeeping duties in one other session on Friday as well. The Reception Desk was probably the most entertaining volunteer opportunity. It was pretty easy work at the reception desk, since there weren’t a whole lot of people registering just before the Craftfest cocktail party, but there were more people registering right before the Thrillerfest Opening Reception on Thursday, so that time slot was quite busy. We did meet Dennis Kennert, the registrar for the whole event, and he helped us through the process. The time there went by pretty quickly, and we met many interesting folks as they registered. The registration packets were all arranged in alphabetical order and the registration bags were already stuffed with the needed material. Each one was stuffed correctly already, so the process went by without any serious problems. We attended the two cocktail parties after our volunteer stints. however, since this was serious business both for the agents and for those pitching. I have to take my hat off to the organizers of Pitchfest. It was obvious that they had done this many times before, it went off with no noticeable glitches. It is a big operation, with many moving parts, and it ran smoothly. A volunteer does get a glimpse into the lay of the land of Pitchfest, and that might help with future butterflies in the stomach when the volunteer turns to pitching. Volunteering at Thrillerfest was a great experience, and I highly recommend it. It felt good to give a little back to a really good organization, and you get to meet a lot of great people. Thursday, July 12, was the final day of Craftfest, and at the end of the day was the Opening Reception of Thrillerfest. This was a two-hour reception with heavy hors d’ouevres, and significant networking opportunities. Each Thrillerfest registrant was given two free drink tickets as part of their package. The first session I attended was by Mark Dawson, “Ten Steps to Making a Living as an Indie Author”. He gave a very interesting and informative presentation about how he operates as an independent author. He discussed tricks involving maintaining mailing lists, and conversing with your readers via websites and social media. He had very good information, but what he does is certainly not easy. For an independent author, the business side of writing seems to take as much if not more time than the writing itself. After that, I sat in on a session titled “Loglines, Elevator Pitches or Comparisons?” chaired by Kathleen Antrim. A logline is a one sentence summary of a film book or television program that usually states the major elements of the story. The highlights of this session for me were Rick Pullen and Linda Sands who writes about female truck drivers. The main thing I learned was that there was a program on the internet called killogator that generates short loglines based on a few questions about your novel. It appeared to be worth investigating further. My next session was chaired by John Lescroart entitled “Adventurers, Secret Agents, or Assassins”. The highlights of this session were presentations by Gayle Lynds and K.J. Howe, who is the head of the Thrillerfest, and who has written the award-winning debut novel. She was really enthusiastic about her book, and is a very sincere and outgoing speaker. This session was followed by a session on “Getting the Legal Facts Correct” chaired by Jonathan Putnam. The highlight of this session was a presentation by Nancy Allen, an author of legal thrillers with whom I was not familiar. She comes across very much like her main character, a “rough around the edges” smart lawyer with deep Ozark roots. I haven’t read any of her books, but if her character in the book is anything like Nancy Allen is in real life, readers are in for a treat with a very colorful main character. Just before lunch, I attended a session in which George R.R. Martin, the author of the Game of Thrones, was interviewed by his editor. He has been designated as this year’s “ThrillerMaster”. Not surprisingly, the session was attended by very many enthusiastic participants. He is a pretty interesting character, and told some very entertaining stories. Due to some personal commitments, I left Thrillerfest after the George R.R. Martin interview. There were two more sets of four parallel sessions and an interview of Megan Abbott by Lee Child. In addition there was another cocktail party I was unable to attend. There were numerous book signing sessions throughout the day. It was a very filled program with four choices of sessions run in parallel. Thrillerfest makes audiotapes of each session available at extra cost should there be any sessions a participant may have missed. On the second day of Thrillerfest, I attended a session titled “Hoorah, Hooah, or Oorah: Heroes of Today”. This session included presentations by special forces personnel, always interesting to see and meet in person, but not of much direct value to my own work. The most valuable session of the entire Thrillerfest experience was the Debut Author Breakfast which was very well attended and excellent. It is very interesting to see what was published within the year and get a handle on what sells. Steve Berry was the MC and did a really good job getting through all of the authors. He also made the valuable point that these books would be good to read, or at least look through to see what sells currently. I thought that was an excellent, but expensive idea. I attended an interview of James Rollins, the Silver Bullet Award winner, who was interviewed by Steve Berry. Rollins was an ex-veterinarian who made it very big as a thriller author. He and Berry did a lot of reminiscing, and it turned out to be a very good interview. There was a large panel session of past and present ThrillerMasters including Lee Child, Heather Graham, George R.R. Martin, David Morrell, and R.L. Stine. They did a terrific job, and it was an entertaining and informative panel to attend. In addition, there is a large Thriller Awards Banquet as well as a pre-banquet reception at the conclusion of the second day of Thrillerfest. It is not included in the Thrillerfest Registration and does require an extra fee. I have never attended this banquet, but have heard it is a lot of fun. Thrillerfest had a very different vibe than Craftfest. For me, Craftfest was a much better experience. I learned a lot during those classes. I found the panel sessions at Thrillerfest to be highly entertaining but less informative. There was a good deal of bookselling and promotion of the authors’ individual brands. To be fair to the presenters, however, the self-promotion never intruded on what were very interesting and informative sessions. The authors were very generous with their time and advice, both inside and outside of the formal presentations. The business of book selling never overshadowed the honest sharing of knowledge. The Debut Authors Breakfast is not to be missed. It was that same strange mix of information, inspiration, and intimidation all rolled into one. These authors work very hard at their craft. They are surprisingly open with advice and their own stories of both success and failures. There persistence and discipline might be the overwhelming theme of the conference. The conference is expensive, as is staying in New York City, but if you are serious about writing thrillers or just want to see what thrillers are all about, this conference is a lot of fun. Exhausting but fun!